American Gunsmith is a monthly print publication containing premium content from top gunsmiths. Our ad-free articles are 100% subscriber supported. That lets our writer-gunsmiths tell it like it is. New subscribers also receive a free bonus. 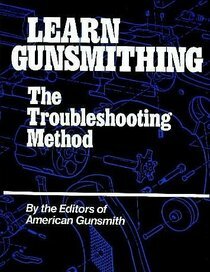 In addition to your monthly print issues of American Gunsmith mailed to you, new subscribers receive a copy of LEARN GUNSMITHING, The Troubleshooting Method. Note: This book offer is for new subscribers only.